Start your Social Media with this Master Template and develop your successful social media strategy today! You have been asked to present a social media strategy on your next team meeting and not sure where to start? 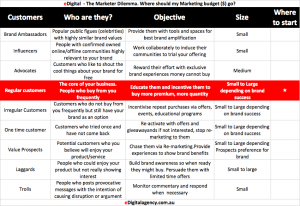 You are an entrepreneur who need to have clarity on where to focus your limited marketing budget on social media?This article is for you as it will explain and guide you in the process of setting up your social media strategy what you need to include in your social media strategy template. First you need understand what a Social Media Strategy is and what it is not! WHAT DOES SOCIAL MEDIA STRATEGY REALLY MEAN? Why your brand is investing in social media marketing. Where your social media executions will be taken place. Which specific social media platforms you will focus on. Who will be responsible to measure, audit, manage, execute optimise, report and present the results. How much is the cost of your social media strategy and the expected return on investment. Your Social Media Strategy is delivered on your social media marketing plan that defines all the above points. Tip: Ensure your strategy is no longer than one year vision as things in social media changes so quickly and set it up in a collaborative environment where your team and agencies have access to it. Your social media strategy has to be concise and provide the governing principles and steps that guide the plan. Below is a summary of key content to include in your strategy document. Increase sales via production of social media stories that move customers from awareness all the way to loyalty and advocacy. Brief agencies and other providers so much easier. By sharing this template with your agencies, your freelance social media manager or PR agency they will quickly and easily understand your social media activity and goals. Keep consistency. Specially when using campaign tagging parameters you need to ensure everyone gets it right. The template offers a campaign tagging tool you can use straight away. Monitor your social media activities, progress and success. Customer profiling tweak. Is your current social media strategy really taking care of your most profitable customer segment? Your most profitable customer segment tends to be that 20% of customers bringing 80 percent or more of your revenue. How is your social media inspiring them to buy more quantity, more often, more premium or bring more of their friends? Content tweak. Are you only sharing info that talks about you and your products services and engagement rates are low? You might want to try re-sharing real authentic customer stories using your products or services. We at eDigital for example have found success publishing micro niche “ever-green” content that solves very specific digital marketing issues. Some of these content that does not necessarily sells any of our services is part of our top 20 most visited pages on our site. The benefit is that we believe is that as long as we are helping a marketer solve an issue is worth the investment, even if that means it is not a direct sale. Channel time investment tweak. For some reason, your CEO says you need to be on all social media platforms so you go and open accounts in all of them to realise you do not really have the time it needs to really build an audience on each platform. With limited time, budget and human resources helping you with your social media strategy you will need to choose your top 1-2 platforms where you believe your most valuable customer segment is more open to hear from you. Do not be afraid of de-activate a social media platform (keep the account just in case) if that means you will have more time to post, respond and participate and build deeper relations on a specific platform. If you need advice on how to present the case to your CEO, please contact us. Use last year’s data to inform this year’s strategy. Dive into last year’s social media analytics and figure out what worked and what fell flat. Look at the success (or failure) of the social media campaigns you launched, the activity and engagement on all of your platforms, and what type of content resonated with your audience the most. You can do this by conducting a social media audit. An audit keeps your finger on the pulse of your social media strategy to see what’s working and what’s not. Based on the previous year’s data reports, you might want to switch up the time of day you post, in order to reach more of your target audience and drum up more engagement. Or, you might want to focus on Facebook over Instagram because you’ve seen more consistent return on investment (ROI) on one platform versus the other. Consider current trends and how you might integrate them into your plan. Social moves quick and so it makes sense that you’d want to incorporate—or at least consider—the most up-to-date trends in the industry. Research trends—both recent and upcoming—then assess them against your business goals to determine if any of them are right for your brand’s strategy. Crafting your brand visual story consistently across all social media platforms. Does it feel your social media profiles are from different businesses? If so, get this fixed immediately! This is the most important component of the social media strategy. You must define your visual branding, voice and tone. Are your messages conveying “value” to your most valuable customer segments? Keep an eye over what your competitors are communicating and be alert to approach opportunities. Use growth hacking tactics to get build your social media audiences. What automated growth marketing software are you using that is helping you build your social media audiences? Contact us if you need professional advice on this regard. Treating social media as business as usual. Promoting your services via social media requires creativity, reinvention and breaking rules. Because there are no gatekeepers, people are constantly pushing the limits and demanding more real-ness and more honesty. Businesses that treat social media as just another mass marketing channel will fail. Your highly curated images are not getting likes. People are now used to see real people using and enjoying your category products. Having the “style perfect” photo is not enough. You will need to dedicate more time to listen and track your customers content, pinpoint whats relevant to share with your community. You run social media ads but no-one is really following up. Have you noticed companies that run social media ads but when you comment on these paid (boosted) posts there is no-one really responding? In this scenario, you will need to accommodate some social media budget into someone in your team who can responds to custoemrs commentary. Only publishing social media posts about your product and services. How many times does your potential and current customers need to know your product can help them solve a problem? In this scenario your social media strategy is only trying to increase preference. Your social media strategy should also invest on the other parts of your customer purchase funnel: category awareness, comparison, trial, purchase, repeat purchase, loyalty, advocacy, better usage via education, community support. The CEO does not really care about social media efforts. this can be common if your ceo is a baby boomer and did not grow up using social media. You need to ensure your social media objectives and linked to the overall marketing and sales objectives. This way any progress you make, it can be reflected on overall sales and marketing targets that your CEO can easily understand. YOUR SALES TEAM NEED TO BECOME SOCIAL SELLERS. IMMEDIATELY! Majority of people consider social media important to closing deals! Social media should be about building your sales team as “trusted advisors”. Cold phone calls are less effective. So, how can your sales team use their social tools to bring quality leads, nurture them and win new deals? Social media should be you sales team go-to destination for learning about potential customers. Your sales team get “valuable insights” about prospective customers from social networks. Potential customers won’t engage with people who don’t know their business. That’s where “e-stalking” comes in handy. Look closely at the other person’s social media profiles, specially LinkedIn to see how they describe themselves. Note how they talk about their roles, past and present. Comb through their skills and endorsements to see what technologies they regularly use. Elsewhere, note what they tweet about, who they follow, and if they share information on smaller, industry-specific social networks. Buyers prefer to work with sales people that already have a social media presence. Buyers of your services or products might also be looking for “an informative LinkedIn profile about you sales rep” before they consider talking with anyone of your sales team. Your sales team social profiles are hugely important to helping them achive ttheir sales targets. Get a hand helping them improve their social media profiles. There are always opportunities to improve their social media profiles. For example, your sales team should pack their LinkedIn job history with interesting details and accomplishments, and consider writing something in their summary to help people get to know them. Do not limit to linkedin but also check other social media platforms where potential customers might go to look for your sales team profiles. These might include: Instagram, facebook or specific industry networks. Some few appropriate personal details can humanise their profiles. I like to share some of my hobbies: jungle trekking, spanish literature, latin dancing, football, making it even easy for someone to approach me. No surprise I have clients interested in similar topics. Buyers care more about trust than price. This is one the most important aspects your social media strategy should help you build: Trust. Potential Buyers need to feel they can trust your sales team reps. Social media is a great way to build transparency and transparency build trust. Your sales team should send “transparency” signals that potential buyers can trust them and see them as “trusted advisors”. Transparency signals can include: approximate costs and profit margins they make, quality and sourced providers, trial periods, certifications, industry rewards. According to the 2017 Linkedin State of Sales Report “trust ” is the most important factor when choosing a new provider, 3 times far more important than the second in the list: price. Buyers will contact a sales rep they remember – likely from social media content and/or e-newsletters your sales rep has shared –. Even if you sales team is sending emails with fantastic information and some potential customers do not open these emails, it is ok. We all have super busy schedules and most of the time we cannot read great info that hit our inboxes, that does not mean we are not interested, simply it is not top priority. The great thing about social media combine with email follow ups is that when a potential buyer is looking for products or services you offer, he will be more likely to contact the ones he remembers – likely from interesting social media posts and e-newsletters. We are investing in social media marketing because our most valuable customer segments are not only using social media when comparing, finding new products and taking purchase decisions about our category but also they are expecting from us to offer them information – via social media – that help them better use our products. We will start with a full social media audit, benchmarking current results against our top 3 competitors and implement key improvements identified. The foundation of our social media strategy will be promoting: the content generated by our users with our products, our “ever-green” content pieces, seasonal campaign stories and promotions. We recognise that we will need to allocate some budget $$ for boosted posts to achieve our reach and engagement objectives. Key part of our Social Media Marketing Strategy will be to participate (comment or partner) in other key social media key accounts, forums and social media places where our current and potential customers hang out. We will allocate 10% of our social media budget to respond to customer feedback, comments, questions and general enquiries publish via social media channels. Increasing our engagement (likes, shares, comments) will be our focused to help aid purchase through organic & paid activity. We will use social media to shape sentiment in all our different type of customers: potential and current customers, best customers in our loyalty program (frequent buyers), advocates, influencers and detractors, critics and online bullies/attackers. Goals define your high-level aims and objectives use SMART criteria to ensure each goal has a measurable set of criteria against which to evaluate progress. You can use SMART criteria for objectives because they encourage you to think about the practicality of achieving each goal, rather than focusing on things that sound good but might not be feasible. Demonstrate the impact and ROI of social media to the wider stakeholders of the business. Increase 50% (Measurable) the amount of people visiting our product pages from social media channels (Specific- Achievable -Relevant) compared to last financial year (Time based). Below is our eDigital “Customer buying cycle” graph you could use to framework your Social Media Strategy by looking at each phase of your customer purchase cycle. Here you set out the business challenges for successful social media marketing that need to be overcome by your team and the strategic actions and activities that will enable them. Strategic Challenge 1: Limited understanding of new social media platforms playing a growing role in our industry: Snapchat, Instagram. Strategic Response 1: We will evaluate it as part of our social media audit, invest in training and design guidelines for usage when appropriate. This section will define who exactly you want reach and engage with on social media platforms. Regular customers who are either on our Loyalty Program or are already connected to our social media channels. Key Social Media content: We will use special offers, educational demo videos for premium products and $50 voucher for every person who have signed up from their recommendations. Customers who have bought your products but aren’t regular shoppers and haven’t connected on social media. Goal: Get them to re-purchase our products. People who have visited but have not purchased from us. Key Social Media Content: activation events, influencer content, special seasonal deals and promotions. Customers with a following base higher than 10.000 followers per channel who are using our products. Goal: Offer them free produt in exchange of an agreed set of posts. Key Social Media Content: we will let them create their own content with our products. Goal: Respond and take conversations offline when appropiate. Offer free ex-change if applies. Key Social Media Content: we will use”xyz” social media listening tool to find these content to respond in a timely manner. Here you will spell out what you’ll be doing for each social network to satisfy the goals of your social strategy. Include a brief description on any related process, people and tools. Sharing interesting and inspirational posts from other facebook accounts. Highlight customer service success stories at least 2 times a week. Facebook carousel image ads will be trialled around product launches or specific campaign pushes. This section is to describe how social will align with other marketing channels so that the people doing the work understand the wider picture. We will promote email sign-up as part of our social media content calendar with specific offers. We will feature popular social content in relevant e-newsletter emails. Last phase during the execution of your Social Media Marketing Plan is to ensure you are measuring progress and have your success metrics ready to be compared with your initial baseline. HOW TO MEASURE SOCIAL MEDIA? 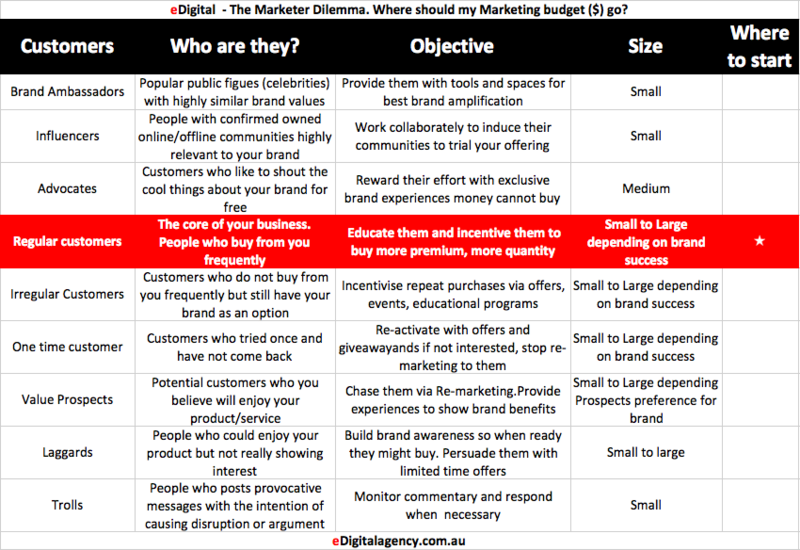 Start by defining the KPIs for your social strategy, which should break down into macro KPIs (for the whole strategy e.g. increase traffic from social media) and micro KPIs (channel specific e.g. increase number of comments in facebook). You should align your KPI expectations with the metrics that you can track for each social network so that they can easily be measured. Then check that your web analytics tools are configured correctly to capture all relevant data. Include details of the reporting you’ll do to measure performance, and where these reports can be accessed. Who will lead the review (business sponsor)? How often will the review take place? What data/insights will be used to inform the review? How will outputs be measured/monitored? Some people include social media guidelines in the strategy but we don’t think this is the best approach. Guidelines are part of the tactical execution, providing a set of rules for the business to adhere to. It’s not a strategic activity, so this content sits best within the tactical plan, or as a separate document referenced by the plan. This section is for you to include the links to all other documents that are relevant to your social media strategy so that anyone in your team or agency support can find them and get the full picture. 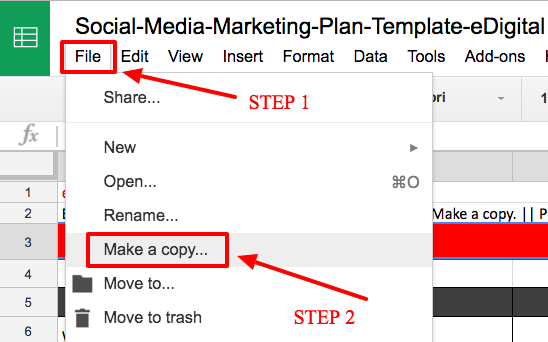 SOCIAL MEDIA MARKETING PLAN – THE TACTICAL PLAN! Before you start your social media activation, it is critical your social media team and partners understand your brand. In this section, you will write down key information about your brand including: What issues/problems the brand is trying to solved? Unique elements brought to market: product features, range, delivery, customer service, rewards, program, convenience, cost saving. It will also asks you to define your brand mission, vision, values, language, design. In this section, you will map out all the social media activities to reach every single customer touch point within the Customer Purchase Journey. This includes: category need, brand awareness, brand consideration, brand preference, trial, purchase, evaluation/review, loyalty, advocacy, co-creation. This is a stand alone section of your plan and should define the all tactical social media activities your social media audiences will see, read and listen. you will be performing every month. Your social media calendar should allow you to easily see what has been scheduled to be published on each social media platform. We suggest to keep this tactical calendar only three months in advance as things change so quickly. You will access pre-built tables to present your monthly social media results by owned media and earned media. There are specific columns for % change compared with previous month and same month last year. When working with different team and on multiple projects, it is important to have a list of key social media activities/tasks you and your teams need to track and ensure they get completed. Here you can also track all the key deliverables you confirmed on your initial strategy. This can include things such as: when your social media audit needs to be completed, review of the suitability of new platforms, measurement framework to be devised, end of phase evaluation report to be completed, etc. This area is to have an accurate picture on how you are spending your social media budget. It should be a no-brainer. We recommend using campaign tracking parameters (commonly called: UTM parameters) in all URLs you promote or share via social media. This means adding UTM parameters for at least medium, source and campaign. Using UTM parameters will help you drill down into traffic from social and isolate specific elements of activity, such as individual links. You can use this for differentiating between different content formats, such as text vs. image vs. video updates for the same campaign. You can overlay e-commerce goals and/or conversion data to see what specific social media post(s) are adding the most value, and use the learning to fine tune your social media strategy. The template shows an example on how to do Social Media benchmark for Instagram. So you can compare your engagement levels against competitors. This is a great section to get your social media freelancer to complete so all her social media posts and destination urls are organised and log in one single sheet. Social Media Live Streams require far more preparation than your usual social media posting. Therefore, this section allows you to add your future live streams including your live stream details: Campaign name, live stream title, speakers, date and time, filming location. This is a great section within the plan template to record and log all your stakeholders activation ideas. You will be able to log all their ideas and you will be presented with an effective way to specific way to review them and prioritise them. This section is really useful for enterprise level marketers who are looking to review a new social media management tool in the near future. You will have access to the best questions you should be asking your potential social media management vendor. You will have access to more than 200 yearly hashtag events organised by month so you can easily match what’s trending with your social media activity. Helps you plan tangible executions for your customer journey! This template will help you identify and plan key social media activities and develop a strategy to make your business stand out in social media, increase customer awareness of your product and services, increase preference and trial and ultimately drive people to buy (purchase), increase repeat purchases and loyalty and advocacy. Helps you keep track of your social media objectives, budget and activities. It has been carefully designed to help you easily present and track your marketing objectives, strategies, budget and tactical executions. Get buy in from other stakeholders. One of the most challenging parts social media is to show ROI to your management team. This template allows you not only to get buy in from your executive team but also allow them to have access if they wish as you can save it as a collaborative Google Sheet. You can hand pick the stakeholders to have access to it. When completing this Social Media Marketing Plan template, you also be asked to write down your brand positioning statement, brand mission, brand vision, brand values and key information about your brand . This Social Media Marketing Plan template will help you set realistic and measurable objectives, includes and action plans, and allocate responsibilities. Once your make the payment, you will be redirected to a page where you can find the link that takes you to the Google Docs where the template is located. Then, you are ready to use the Social Media Marketing Plan Template! 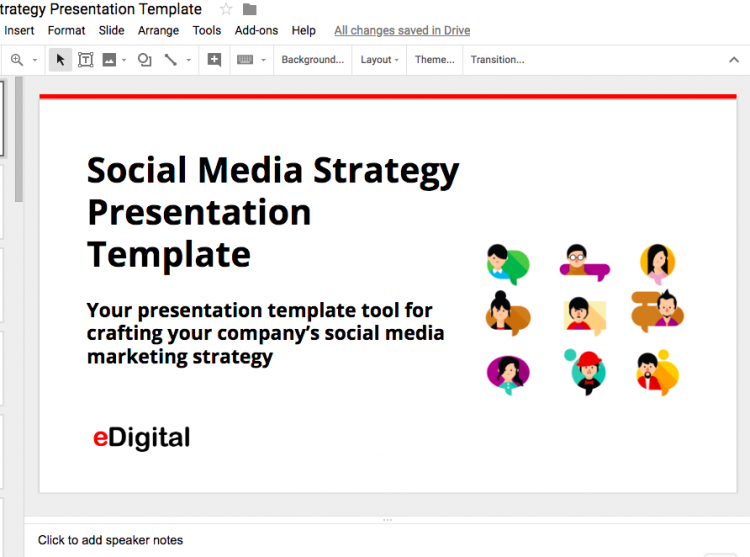 + SOCIAL MEDIA STRATEGY PRESENTATION TEMPLATE – On google slides ready for cross-team collaboration, you can also save it as a “Microsoft Powerpoint” presentation. Not sure whether your Social Media Marketing Plan is ready to be presented to your team?eDigital helps you draft and review your Social Media Marketing Plan. Contact eDigital today! eDigital can also run workshops and training sessions for your team to ensure you have a sound Social Media Marketing Plan.